In Ordinary Greatness, Pam Bilbrey and Brian Jones explore this concept and provide a comprehensive and practical set of tools for excavating the hidden value and talent buried deep without our companies, hospitals, churches and schools. They base their advice on their own substantial experience working with real leaders in real organizations where they’ve helped bring about excellence where others may have seen mediocrity. Ordinary Greatness captures the essence of the expression, “what you see often depends on what you are looking for”. This book is chock full of examples of how leaders can revolutionize themselves, their organizations, and their performance by really “seeing” the unlimited capacity of their people. Pam and Brian remind us that people are always the engine that drives results. This book is to be absorbed not merely read. Caveat Lector! (reader beware). If you like your life the way it is, enjoy the road you’re on, don’t pick up this book. It will challenge you to reconsider your life – and give you practical tools to do so. Everyone can see the top 0.1% of great talent in the world. It requires a special way of viewing the world to see the other 99.9%. Pam and Brian have welded research with wisdom and decanted analysis with soul to give you an opportunity to understand greatness in a new light. And best of all – to see the greatest in your own life. Former Managing Director, Tom Peters Group, Ltd. Ordinary Greatness is a powerful, practical resource for positive change. A wake-up call for leaders and readers everywhere, this groundbreaking book is packed with pointers for capturing the often-overlooked power of ‘ordinary greatness’. Inspiring, relevant examples from everyday life encourage us to learn to notice and celebrate the greatness already surrounding us. Anyone who reads this book and accepts the challenges offered by Pam and Brian will become not only a better leader but a better person. If we seek greatness we will find it - in a local coffee shop; in a hospital; in a school; at home; within oneself - and within "Ordinary Greatness". Pam Bilbrey and Brian Jones have written a compact gem that reveals how ordinary greatness can be found, encouraged, nurtured and celebrated. If we all stepped into our ordinary greatness as Pam and Brian suggest, we would change the world. What are you doing - or not doing - to find "ordinary greatness"? Bilbrey and Jones sharpen our focus and change our perspective with pointers that harness what can be celebrated daily. You'll find it in places you never imagined and, when you do, higher performance and increased productivity are not far away. Buy two copies of this book - one for you and one for your boss. In the most reflective moments of our life we wonder about paths not taken and whether there still might be time to explore new territory. Ordinary Greatness is one of those rare books that allow you to think through what might yet be, both personally and in the wider spheres of existence in our families, and even in our organizations. “What If…?” “Why not…?” “Could I…?” and once those questions begin, the tremendous voyages of our lives can begin. Greatness is there for the taking so be careful – you may not want to risk moving out of your comfort zone. What the authors offer us is a well thought out and tested strategy for moving organizations towards their full potential. The thesis is clearly presented that as we acknowledge the greatness that can be found every day right in front of us then we can create even more of what we most need in this challenging moment. What we most need is the confidence and the certainty that we can succeed and this book shows us how available that is to us if we can just take a moment to stop our rushing towards an immediate solution and fully appreciate the potential that has always been in us. 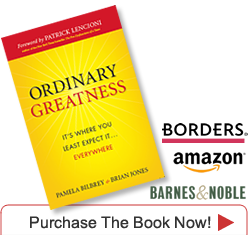 Ordinary Greatness is an inspirational and practical book that guided each person to discover his/her unique gifts and the courage to live their ‘greatness,’ demonstrating the highest forms of personal accountability. A great guidebook loaded with lots of practical advice and strategies to help leaders actualize their potential. In a very real way, this book also shows leaders how to help others be and do more than they thought possible. And unlike many books, the techniques are easy to use – all it takes is opening your eyes to the greatness that exists right before you. Best Burgers and If It Ain’t Broke…BREAK IT! Thank you, Pam & Brian, for reminding us about the good/bad news in discovering talent. The good news is that greatness exists all around us - "acres of diamonds" right in our own back yard. The bad news is that we can easily miss it, as it often comes disguised in ordinary packages.